If you're a road warrior worried that the 9-hour advertised battery life of Apple's new MacBook falls short of the 10 hours on the 13-inch MacBook Pro and MacBook Air, you may be able to lay that fear to rest. A hidden and unadvertised benefit to Apple's switch to the USB-C connector on the new MacBook over MagSafe on older models is that you may be able to buy an external battery pack or power bank. Similar to how smartphone owners can recharge their phones with an external battery pack, a power bank allows MacBook owners to recharge their laptop if they aren't near a power outlet. "Most accessories supporting the USB Type-C specifications should work with your new MacBook," 9to5Mac wrote of the new port. "Apple won't be doing anything to block any specific types of accessories - in fact, it will even allow external batteries or other Macs to charge the new MacBook." 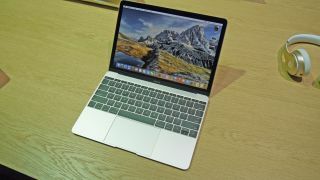 This would be a drastic change from Apple, which is not only moving away from its proprietary MagSafe charging connector, but is also opening up its laptops to third-party charging solutions. In the past, Apple thwarted third-party battery packs like Hyper Juice that utilize non-licensed MagSafe charging tips to connect to a MacBook Air or Pro. Enterprise users will find support for external battery packs extremely useful. Many enterprise workstations and laptops designed for field use come with a user-replaceable battery. When the notebook runs out of power, users can swap a dead battery for a new one and continue working. However, given that Apple's notebooks come with a sealed battery, this isn't a possibility. For workers in the field, carrying a single external battery pack or multiple packs would allow them to have a system that runs longer than the 9-hour battery life from the internal battery. The downside with USB-C is that it may not automatically unlatch from the MacBook if, for example, someone trips on the cord. A benefit that Apple promotes with MagSafe is that if someone trips over your power cord, the magnet from the MagSafe cable would unlatch from the notebook. By having the cable automatically unhook from the laptop, your laptop wouldn't crash on the ground. With the USB-C port on the new MacBook, Apple is not only replacing the MagSafe charging port: it's also replacing standard USB 2.0 and 3.0 ports as well as display-out ports. The port can be used to connect peripherals like external drives, keyboards, monitors and displays. In adapting the new standard, Apple also dropped existing ports like traditional USB, Thunderbolt and Mini DisplayPort. This means that you can only have one thing plugged into the USB port at any given time so you can't charge the notebook and connect a hard drive unless you buy an adapter or hub.